Andrew Makepeace Ladd III and Melissa Gardner, both born to wealth and position, are childhood friends whose lifelong correspondence begins with birthday party thank you notes and summer camp postcards. The pair grow up together, go their separate ways, but continue to share confidences. Now, in Love Letters, Andrew and Melissa sit side by side, reading the notes, letters and cards that have passed between them over nearly fifty years. Their words make it eloquently clear how much they really meant, and gave to, each other over the years—physically apart, perhaps, but spiritually as close as only true lovers can be. 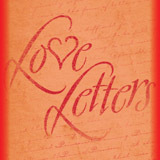 Through letters that are simply written but rich in emotions, they grow, mature and only realize what they truly mean to each other when it's too late.